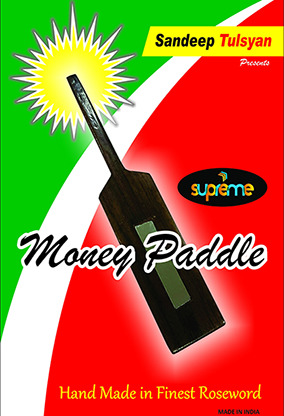 The money paddle! This was one of our FIRST magic tricks, and one that garnered an incredible reaction. More than a trick, this is a lesson in how to squeeze every possibility into a simple paddle move. Entirely easy to do, you cause coins to magically duplicate with a mysterious paddle. As a big finale, you make paper money appear. "How did you do that?" the spectators might ask. "With mirrors!" You show that the paddle now possesses a mirror on both sides. Beautifully made, and a great routine. EFFECT: Three coins on each side of the paddle are shown. The magician removes one coin from the face up side and the coin opposite to it on the other side vanishes. This is repeated one by one. Then magically a bill appears on one side of the paddle. Once the bill is removed a mirror magically appears on both sides of the paddle.